Northwestern coach Fred Williams guided his Highlanders to a come-from-behind win over Gilbert Friday night at Northwestern High School. WINSTED — Northwestern’s girls basketball team pulled away to a 50-41 win over Gilbert in the final two minutes of a crosstown rivalry game that lived up to its rich history Friday night at Northwestern High School. The Highlanders (17-1; 15-1 Berkshire League) wiped out the Yellowjackets (12-6; 10-6 Berkshire League) 52-30 a month ago at The Gilbert School, but, in a packed house complete with Northwestern’s band, this one was up in the air until the final minute. “We realized from the last game, we had to take better care of the ball,” said Gilbert coach Gerry Hicks. So, in a perfect trap game, the Yellowjackets came out in their best start of the season, hustling for rebounds, taking smart shots and pinpointing passes under the hoop for an 11-5 lead at the end of the first quarter, then poured on the gas through the second quarter. Point guard Liz Wexler had five assists and a 3-pointer. Dileysi Sarmiento (10 points); Abbey Beecher (10 points); and Marcy Moreira combined for 7 more assists as Angie Delacruz (10 points) and Sarmiento sent home layup after layup, building to a 23-11 lead. Propfe, Northwestern’s all-star forward, couldn’t find the basket in the first quarter. Unfazed, she began the Highlander comeback with a personal 6-0 run in the half’s final two minutes with a converted steal, an eight-foot jumper and a layup. At the half, the Yellowjacket lead was down to 23-17 with more to come. “The plan was to try to tie it by the end of three,” said Williams. Far from going away, Gilbert kicked its lead back to 29-19 in the first minute of the third period, but the pressure started to show. Instead of the first half’s great passing, the Yellowjackets forced shots while Northwestern now got the big plays under the basket. 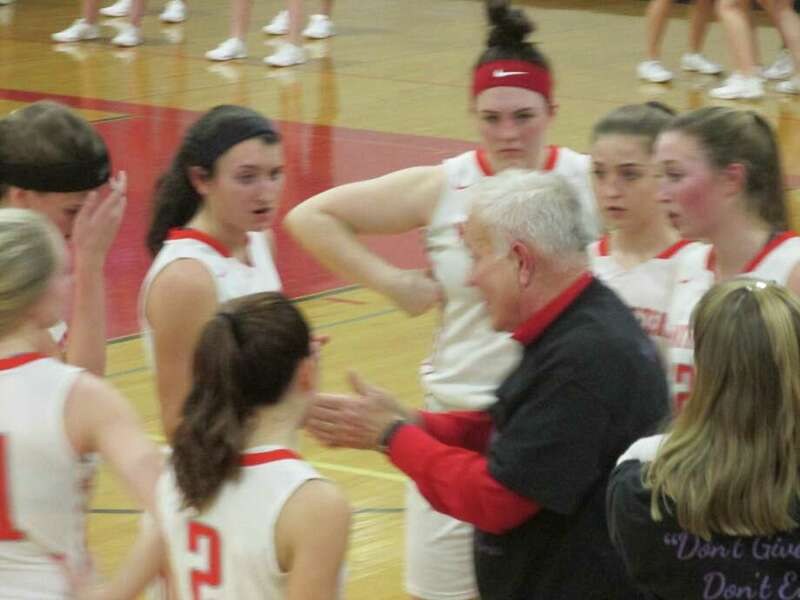 Highlander guard Frankie SeSanti led the way with four assists with a combined eight more from Skylar DiMartino, Emma Cameron, Propfe and Natalie Lederman. For the second time in a row, Northwestern scored the period’s final six points, this time on a layup from Jana Sanden and four more points for Propfe. “We didn’t lose our composure,” said Williams, as the score stood 35-34, Gilbert. “We couldn’t handle the success. When they made a little run, we got nervous,” said Hicks. Nevertheless, the Yellowjackets kept battling. Propfe was the ultimate difference. With 2:39 left, Northwestern led 40-39. A forced Gilbert drive flamed out. At the other end, Propfe had the ball all alone in the corner. With plenty of time to set, she nailed the three. The 43-39 lead allowed the Highlanders to start eating big chunks of time, even with a Wexler drive narrowing it to 43-41. A foul shot and Emma Cameron layup stretched the lead to 46-41 with 47 seconds left. Propfe and Lederman were 4-for-4 from the foul line for the final points. Jill Wexler 3-0-7; Abbey Beecher 4-2-10; Angie Delacruz 5-0-10; Marcy Moreira 2-0-4; Dileysi Sarmiento 5-0-10; Totals: 19-2-41. Frankie DeSanti 1-0-2; Emma Cameron 1-0-2; Skylar DeMartino 4-4-12; Emma Propfe 7-4-19; Natalie Lederman 3-5-11; Jana Sanden 2-0-4; Totals: 18-13-50. 3-point goals: G – Wexler. NW – Propfe. Records: Gilbert 12-6; 10-6 Berkshire League. Northwestern 17-1; 15-1 Berkshire League.